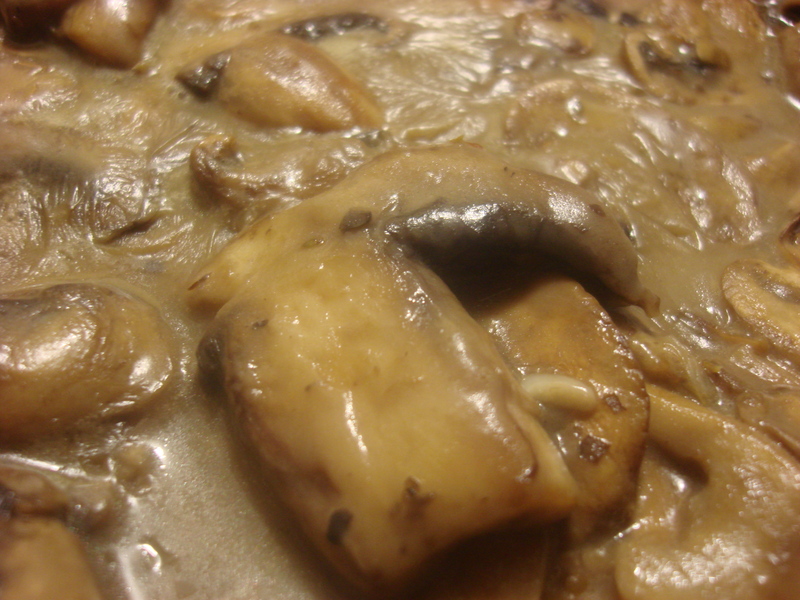 Champiñones al ajillo (Mushrooms in Garlic Sauce) is a classic tapas dish from Spain. I can remember really digging these on my first trip to Spain, back when I was 18 and remarkably stupid and lucky and blessed with an exchange rate that got me lots of pesetas for my parents’ dollars. I’m still remarkably stupid, but everything else seems to have changed. So it’s lovely to be able to recreate a dish that gave me much pleasure while I was realizing there was a whole ‘nother world beyond the confines of North America and to feel that, while change is inevitable, some things are good forever (at least in human understanding of forever). Having said that, this dish is a bit different from what I had way back when. The sauce is more dense, the garlic more subtle. And instead of eating it standing up at a formica counter, with the funny afternoon light of old Madrid coming in the plate glass window, I eat the occasional forkful as I move around the kitchen getting the rest of dinner on the table. And instead of tossing the napkins on the floor for the owner’s son to occasionally sweep away from underfoot, I keep using the soggy paper towel by the sink until it is pretty useless. So I guess whatever I am trying to say is about as clear as mud, but hopefully it covers the ground. Anyhoo, try this one. Enjoy it on a rimmed dish in the middle of the table, jabbing the mushroom bits with toothpicks and sopping up the sauce with crusty bread and drinking little stemless glasses of a rough and ready red, and have fun. Or use it to dress up a steak or burger. It’s easy enough to make, and the flavors may just transport you back to somewhere remembered or forward to somewhere you’d like to go. 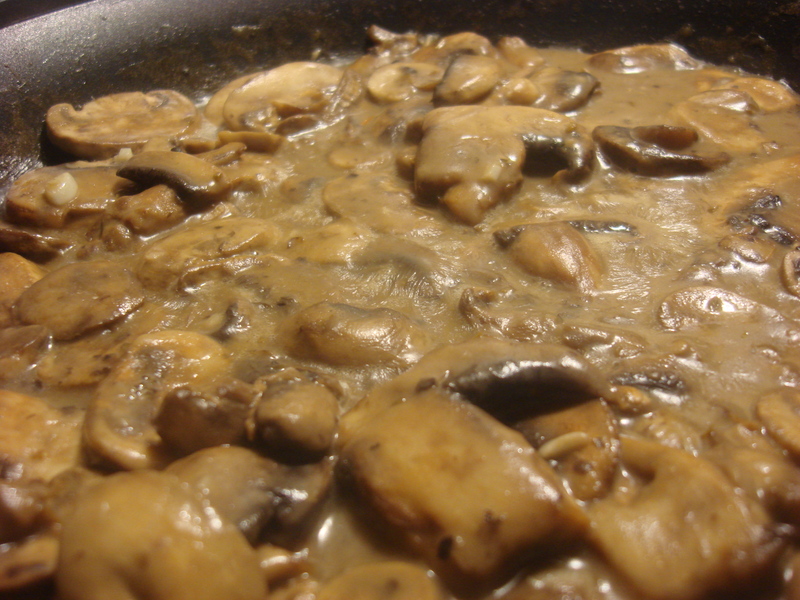 Another Spanish mushroom in garlic sauce, with vegan option…. Heat garlic and 2 Tbs olive oil together at medium heat, turning down as soon as the garlic begins to color. Stir in the flour and mix to a paste. Cook one minute. Add the broth in a thin stream, stirring constantly to incorporate Then add the pepper, the oregano (or half the parsley) and lemon juice and stir until smooth and thick. In a separate pan, heat remaining olive oil on high until quite hot. Add mushrooms and brown. Add mushrooms to the sauce and cook for five minutes. Add remaining parsley, if using, and serve. BTW you always sound quite smart from your posts. That dish looks really good; I bet it’d be excellent over mashed potatoes!! Thanks for the visit. I think you’re right! Mashed sounds delish….